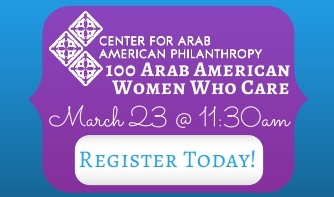 "100 Arab American Women Who Care" is an exciting event organized by the Center for Arab American Philanthropy (CAAP). It brings together dozens of philanthropic women who pool their money to make a larger impact to a cause that matters most to them. At this event, each attendee will nominate a charity of their choice. Three charities will be selected at random, and all attendees will vote on one nonprofit to receive the proceeds raised from the event. Your dollar goes so much further! Tickets cost $100 per person and are fully tax-deductible. Attendees may nominate only Michigan-based nonprofit organizations holding current 501(c)3 status. CAAP retains up to 20 percent of funds raised at the event for administrative costs. Register now for this event by selecting “Individual Ticket” on the left. A delicious brunch will be provided for all attendees. For more information, call Chelsea Liddy at 248-767-1761, or email cliddy@accesscommunity.org.